Special Representative for Haiti Sandra Honoré briefs the Security Council. Amid continuing mistrust and disagreement over the electoral process in Haiti, a senior United Nations official today voiced deep concern over the political stalemate in the country. Briefing the Security Council, Sandra Honoré, head of the UN Stabilization Mission in Haiti (MINUSTAH), said that a key provision of the recently-agreed El Rancho Accord, implied the formation of a new government, changes in the composition of the electoral council, and a new Legislature installed, have not been implemented due to political deadlock. The timely establishment of the electoral body was hampered by a group of politicians opposed to the El Rancho Accord who consistently blocked the required quorum. Stressing that no agreement had been reached on the required framework for the elections to be held, Ms. Honoré expressed particular concern that inability to carry out the polls before the end of the year that may result in “creating an institutional vacuum” after the current Parliament will be rendered dysfunctional on 12 January. In this context, she called for an immediate solution to be found on the basis of the rule of law, hailing the recent signs of willingness of the political the parties to renew an inclusive dialogue, and President Michel Martelly’s intention to engage in discussion with opposition groups and civil society. “While I welcome these various attempts at identifying a consensual solution, through dialogue, as soon as possible, I also wish to call on all actors concerned to ensure that the solution be on the basis of the Constitution and within a solid legal framework that allows for credible, inclusive, and transparent elections in support of a peaceful democratic transition in 2015,” she told the Council. Ms. Honoré went on to note that the overall security environment, including the five Departments vacated by MINUSTAH's military component, has remained relatively stable, adding that only one-fifth of demonstrations are politically-motivated, while the causes of most of them are rooted in socio-economic problems, such as lack of access to education, electricity and water. Underlining the critical importance of guaranteeing the security and, in line with the implementation of the HNP Development Plan 2012-2016, she called for improvements in the operational capacity of the national police force. 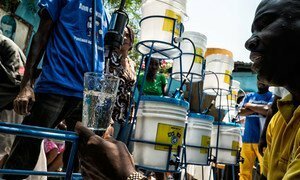 As for the humanitarian situation, Ms. Honoré praised the Haitian Government and its international partners for their efforts in implementing the national cholera elimination plan that has led to the significant reduction of the toll of the epidemic. She also welcomed Government’s initiatives in economic sphere aimed at attracting investors, stimulating economic growth and creating more jobs. The envoy also underscored the essential role of the comprehensive reforms of the justice sector for the positive development of the country. “Without a well-functioning justice system, including corrections, even the best trained and equipped police force will be unable to perform its duties to provide a safe and secure environment, enforce the law, and, ultimately, protect the rights of Haitian citizens”, she said. Finally, Ms. Honoré reiterated her call for the State institutions and public life actors to continue fulfilling their obligations and to assume greater leadership in order to maintain gains in peace, security and stability through the consolidation of the democratic process, the rule of law and good governance. She also underlined that these goals demanded international cooperation, including additional financial aid from global partners. “We will work with the Government, the UN country team and Haiti's international partners to develop a comprehensive transition plan that underpins the gradual reduction of the Mission's footprint,” she concluded. Ms. Sandra Honoré, of Trinidad and Tobago, was appointed as Special Representative and Head of the United Nations Stabilization Mission in Haiti (MINUSTAH) by Secretary General Ban Ki-Moon in May 2013. The Haitian Prime Minister, the UN Special Representative to Haiti and the UN Senior Coordinator for cholera response vowed to press on with intensified efforts to eliminate the disease from the island as reports from the first months of 2014 reflected the lowest number of cases and cholera-related deaths since the beginning of the epidemic.